Good morning and Happy Sunday! What would you do with $400 Paypal Cash? I can think of a lot of things I’d do. Today you’re in luck. 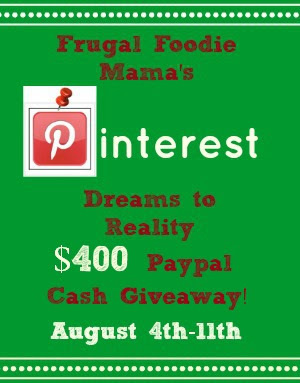 My friend Carrie from Frugal Foodie Mama and a bunch of other bloggers, including myself, came together to bring you this PayPal Cash $400 Giveaway! Please see a complete list of the rules in the disclaimer below. Carrie doesn’t mess around. If you don’t follow them, you are disqualified. Twitter. Let’s talk about Twitter. Do not use an account that you set up for the sole purpose of entering giveaways. That will get you disqualified. If you are selected as a winner, you will have 48 hours after being contacted by Carrie to respond to her. If you do not respond, she will select another winner. She will contact you via email so be sure to periodically check your spam box in case it goes there. Awesome giveaway! Thanks for sponsoring along with Carrie and so many other fantastic bloggers!